KeyForge Call of the Archons is certainly one of 2018’s hottest card games and we have managed to get our hands on the starter set and a few extra decks to test the game out! 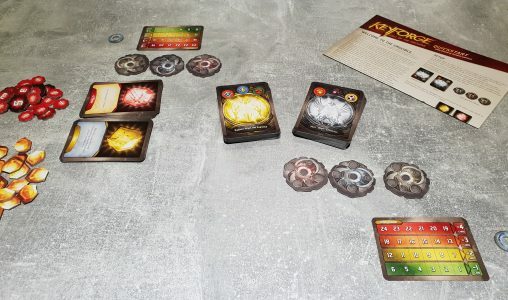 The game sees 2 players playing creatures, gaining Æmber and forging keys for around 20 – 45 minutes. Coming from esteemed designer Richard Garfield and heavyweight publisher Fantasy Flight Games, the game certainly has the right backing. However, is there enough to hook players? Let’s find out! The KeyForge starter set itself comes with a total of four decks, two different starter decks which are identical in every starter set and two unique decks. Also included are a range of tokens and cards used to play the game, to track: creatures being stunned, damage taken, Æmber earnt, Chains begrudgingly taken and Keys players must forge – yes the objective is subtally in the game name. Summary rules are in the box however if you want the full rules they are available online and are irritatingly not included. It is possible to use “proxy” tokens from other games for the tokens mentioned but for the purpose of the review only official tokens were used – to get the complete KeyForge experience. KeyForge Call of the Archons has a total of seven different houses, each with a total of 50 cards. Each KeyForge deck is made up of 37 cards. It comprises of a reference card and 36 actual cards – 12 cards from 3 of the houses. Cards come in four main types: creatures, actions, upgrades and artifacts. Decks come with a generated name, ranging from the unusual sounding Honourable “Paintrain” Galverstead to the more dignified Dredd, the Dragontamer of Sophistication. Each plays a bit differently, driven by the houses included. Sanctum for example have shields that can sponge damage, while Logos seems more about drawing additional cards. At the start of the game each player removes the reference card and shuffles their deck. This is the point at which a player with a deck deemed stronger would take chains, something to ignore for your first few games. The starting player draws seven cards, with the second player drawing only six. Players can choose to keep this hand of cards or ditch it, drawing one less card as a result. Once ready to play, the starting player can only play a single card – after this the playing cards aspect is opened up. 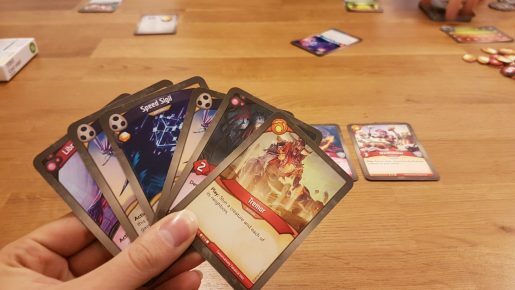 The core mechanic behind playing cards is the first gameplay point where KeyForge takes a giant stride away from other deck based card games. On a turn players must choose one of their three houses. On that turn the player can then play as many cards of that house as they wish from their hand, entering play exhausted by default, use any ready cards from that house on the table and discard cards of that house from their hand. There are simply no costs to consider. When entering play some cards will have a Play ability such as stealing Æmber or becoming unexhausted. On top of this some will create Æmber – something you’ll need to collect. Any unexhausted artifacts and creatures of the chosen house can then be used, with creatures able to either fight or reap. Fighting works in a similar way to other deck games, with a strength value being used for health and attack damage. When you choose for a creature to fight you pick an opponent’s creature to attack. Their creature takes damage equal to your creatures strength value and you creature takes damage equal to their strength value. If the creature is killed it is put into the player’s discard pile, otherwise it takes damage tokens equal to the amount. Damaged creatures still dish out their full strength value of damage but, intuitively, are easier to kill. There are some special effects that specific cards have, such as evasion, which can stop a creature taking damage – or shields that mitigate damage. Reaping is the other action creatures can take gaining the player a single Æmber. By default having Æmber during a turn is promising but only at the start of your turn is it possible to forge a key, costing six Æmber. To help you on your way or to hinder and opponent are the other card types. Upgrades can be applied to any played creature, regardless of their house, giving permanent buffs or abilities. These only leave play when the creature it is attached to is removed – joining the discard pile with the creature. Actions are one time use cards, being discarded afterwards. They can be strong creature destroying abilities or just minor benefits depending on the card. Artifacts must be put into play first like creatures, but are then effectively actions you can take whenever that house is chosen. Players take it in turns, back and forth, hopefully forging a key, choosing a house to play, using that house, before drawing back up to six cards. If a players draw deck runs out they take their discard pile, shuffle it, and then continue to draw. The game plays until one player has forged a third key and they are the winner. There is no way the game can be tied in casual play, though timed tournaments may see ties be possible. Activating only one house is a central mechanic to KeyForge and it takes a game to get used to. Not only do cards not have individual costs to play but they cannot be used unless they are from the selected house – even if they are ready and in play. This means you can play and discard to form a hand full of one house ready to play a bumper turn. Though, after a few games when to splash cards down or hold some back will become apparent. Combos are rife and ready for the taking when players have learnt the cards in their deck; giving more meaning to playing with the same exact decks from one game ot the next. Chains are as much of an interesting concept as they are a defined mechanism. A handful of cards give these as a negative to the player for using what are strong, impactful, cards. When a player has chains they take them on their chain tracker and when drawing cards – depending on the row on the tracker – draw up to less cards than normal, before losing a chain. For example a player with 3 chains would draw up to a maximum of 5 cards before dropping to two chains. Once the chains are gone the player can once again draw normally at the end of their turn. Chains also promise to balance the individual decks against each other, yet it is almost left to a gentleman’s/lady’s agreement. The logic is that at proper tournaments decks can be balanced by awarding correct amounts of chains to one deck versus another, but the game is crying out for a public play version of this. Players can already add their decks to KeyForge online and this, or the app, would be a great way to tap into the database’s knowledge, once it has been built up over many games, to award chains accordingly. Fair amounts of chains can be determined through playing with the same decks, swapping whom plays with them can further this. It might sound daunting at first, having to self balance the game but a few games in players seem to gain enough of an understanding to at least suggest one deck taking a chain or two, even if it isn’t anything drastic. This does mean that one deck can be ‘better’ than another, from the instant they come out the wrapper, and this isn’t something that can be fixed as there is no deck building in KeyForge. 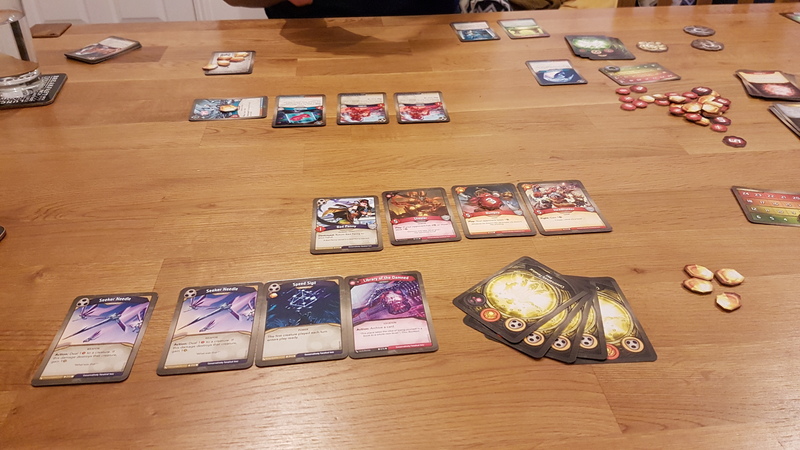 Deck building is where players can swap cards in and out of a deck, often to create one master deck they play with. Not including deck building is a bold move for KeyForge as it is how many card games keep things from getting stale over time. Releasing packs and new ranges of cards to add into your deck is often a draw for the likes of Magic or Hearthstone. This is also a massive turn off for gamers like myself whom don’t want to sink money into obtaining powerful cards. Once you’ve brought a KeyForge deck there is no swapping, no tweaking, it is effectively a set – and a unique one at that. Each card in a set is listed on the deck reference card and individual cards show which deck they belong to. Insane combos and game breaking elements may surface with time but for the most part each deck seems to have strengths and weaknesses. One extreme example is one deck we played with which includes a card Pitlord. Pitlord has strength of nine but it forces you to only use the house Dis, which it is part of, until it leaves play. It is possible for an opponent to lock you out of the game by playing a 1 strength creatures Restringuntus, as it allows the opponent to call a house that cannot be used til it leaves play. Of course this combo happened to me, seeing me instantly out of the game. It sounds game breaking but it is more of a learning experience to not play that card against a deck with a Restringuntus included. It was an extreme case but it shows how the game has depth, something that could be an issue and how the game works around it all in one go. KeyForge has all the excitement of standard deck based card games but comes without the necessity to stay up-to-date with the card pool. Fantasy Flight has thrown around huge numbers to prove the number of unique decks there can be, my only concern is how they keep the excitement. Buying packs is part of that excitement of other titles. Nevertheless, for the ability to pick up the game and always have complete decks to play with, each with their own styles, the game captures the fun, fast gameplay gamers look for. Without attempting to sound egocentric… KeyForge is pretty much targeted at players like myself. I’ve glanced at Magic in the past but been somewhat daunted by the plethora of cards available, forming a barrier of entry. Games like Hearthstone have put me off with the constant push to buy new cards. 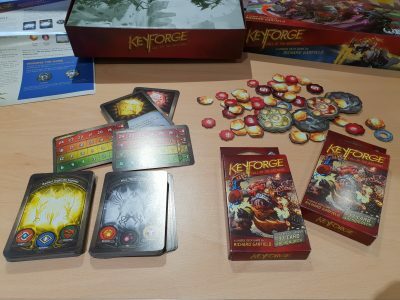 In KeyForge I am drawn towards buying more but out of choice for wanting to see, and unpack, new decks – not in a need to keep up. 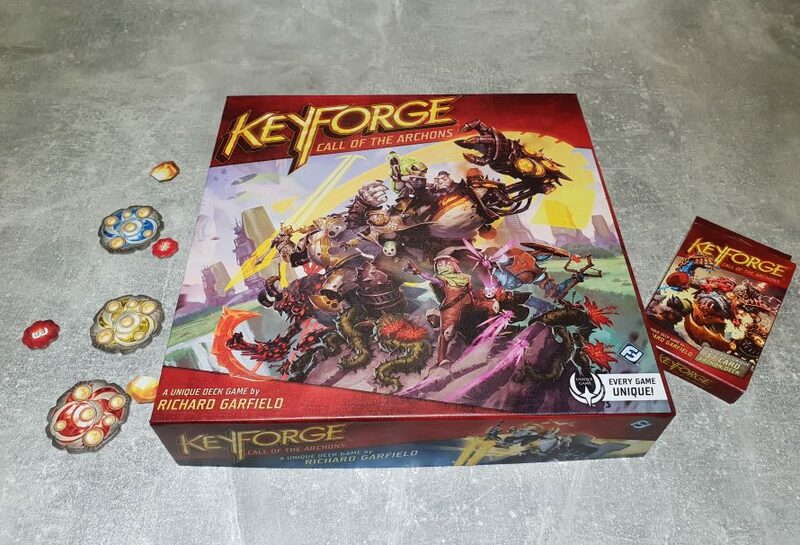 As starter sets go KeyForge’s is an interesting mix – offering everything you could need to play (minus the full rulebook). It is almost a shame that the non-unique decks will be set aside by many after a few learning games, in search for the fun of the unique decks. One thing is for sure though, whether you just grab a couple of decks or the starter set, KeyForge can provide hours of entertainment!